This is a guest post written by an expert in adventure travel with dogs, Jen from Long Haul Trekkers. Scroll to the bottom of the article to read more about her. Thirteen miles into a 15-mile training run, my dog, Sora and I came upon a group of senior bird watchers stopped on the trail, peering among the trees in search of a bird. Two of them had small dogs along for the walk and Sora headed right for the first, a poodle. She snarled, lunged and snapped at it. All of the senior birders reacted in horror as Sora made her way to the second dog to do the same. I felt beyond embarrassed and also exhausted from the run. I couldn’t react quickly enough to grab her before going up to the second dog and repeating the act all over again. The dogs were fine, and I apologized profusely. As soon as we passed the final birder, I secured her leash and never again ran or hiked with her off-leash. That experience finally taught me what we had always known, but avoided admitting: Sora is not good off-leash dog. My partner, Dave and I so badly wanted Sora to be the dog we could take to the park and let run around with the other dogs. I thought I had found the perfect trail running companion who would come when called every single time and not become distracted by other people or dogs on the trail. We wanted her to be the dog who could roam free on the Oregon Coast and not go after the other dogs. We worked on her recall training every chance we got, but she still always seemed to pick a fight on the trail. We felt embarrassed, bad for the other dog and its owner, and like we had failed Sora. It took us awhile before we finally came to terms with the fact that she never would be good off-leash, no matter the amount of exposure, training, or desire we had for her. We equated Sora not doing well off-leash to “she’s a mean dog.” But she’s not. She’s a rescued herder with an instinct to chase and push other animals around. It doesn’t mean she’s a mean dog. She just is who she is. Now that we have a full-time on-leash dog, I know what I put others through when they saw a strange dog coming at them, interrupting their outdoor activity. It made them feel stressed, scared, and frustrated. I know because this is how I feel when someone allows their off-leash dog approach us. I know as well as anyone the vision of having a perfect dog who can run around off –leash during hikes and runs, but the fact is that your actions put others at risk and it disturbs their peace. Encountering off-leash dogs on the trail is a regular occurrence for us, and we rely on a few tactics to help avoid the inevitable unwarranted meetings. You never know how a dog is going to react, so you can only control how you respond. We can never expect a dog owner to know the proper etiquette when it comes to dogs, nor should we assume that their dog is trained. The best approach in a situation when an off-leash dog approaches yours is to focus your attention on controlling your own dog and remain calm. Below, are my 7 tips for handling off-leash dogs while hiking. Because Sora can be reactive with other dogs, we are always keeping an eye out for loose pups on the trails. We watch if the dog is running up to other dogs or sticking close to his human. Does the owner have a leash at the ready to control him if necessary? Is the dog coming immediately when called or is he ignoring the command, completely dialed in to your dog? Factor in all of these visuals as you size up the situation. Learning to read dog body language is key in handling situations with off-leash dogs. A stiff body signifies discomfort or dominance. Slow approach with a rigid body, growling, and shifty eyes can mean the dog may attack. A raised tail can have mixed meanings, depending on other body language accompanying that tail. After initially meeting, a raised tail for a dog to smell a behind is a “nice to meet you!” and wagging tails can mean “What’s up? I’m interested…” Raised hackles can signify that the dog is on guard. Knowing your dog well and dog behavior in general will save you from any potentially dangerous situations. Click HERE for illustrations that will show you how to read a dog’s body language. Any time we cross paths with a dog, whether on or off leash, I move Sora to the opposite side of my body from where the dog is, allowing my body to act as a blocker between the two. If I can, I also find a spot on the side of the trail where I wait with Sora, still blocking her with my body, until the dog has passed. If I spot a dog sprinting toward us, I block Sora and hold out my hand in a STOP motion and shout “eht!” to try to stop it from advancing. It doesn’t always work, if the dog is set on a mission, but it does often startle him and breaks his focus. It also alerts the owner that I don’t want their dog approaching and serves as a signal to initiate recall or to come and get their dog. If the dog approaches regardless of you acting on the above steps, remain calm. Dogs can feel your nervous energy through a taut leash or your body posture. Because Sora tends to dominate, we have had to learn how to best introduce her to dogs. This has taken a lot of practice, understanding of her, and trial and error. We always let the other dog approach first, take a sniff of her bum, and pet her chin in the meanwhile, praising her for accepting the new dog. We use a Gentle Leader, which allows us to better control her face, never allowing her to meet a new dog face to face. The goal is to show the dog that you are in charge and you are not giving him permission to approach. Do not look him in the eye, as that is seen as a threat to dogs. Sometimes, I even growl to speak dog language to let the dog know that he’s invading my space. When a dog won’t back off— whether friendly or not, I call to the owner and ask them directly, yet politely, to please get their dog and to keep their him on leash. It isn’t fair to others to allow your off-leash dog to interrupt their activity and it’s rude to do so without first asking. 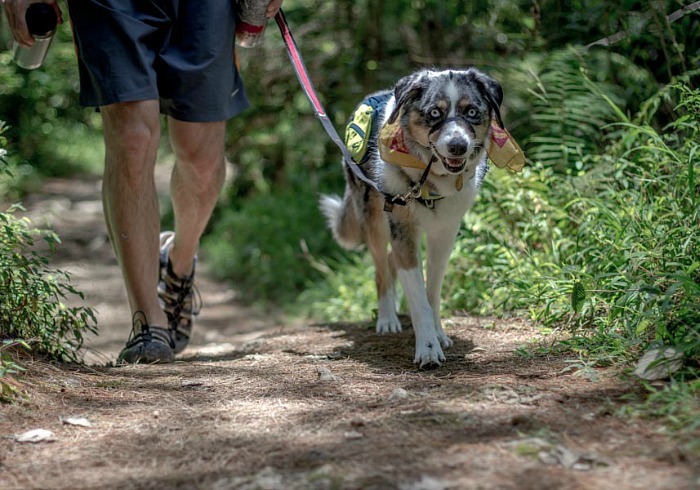 Not only will keeping your dog under control create more peaceful encounters on the trail, it will also avoid unnecessary stress and potential altercations between dogs. I’ve learned from my experiences with Sora that the one and only place where all dog owners agree to gather in a setting where dogs may roam free are off-leash dog parks. Unless your pup has impeccable recall or he stays behind you while you hike, please keep your dog on leash. What do you do when you encounter off-leash dogs on the trail? 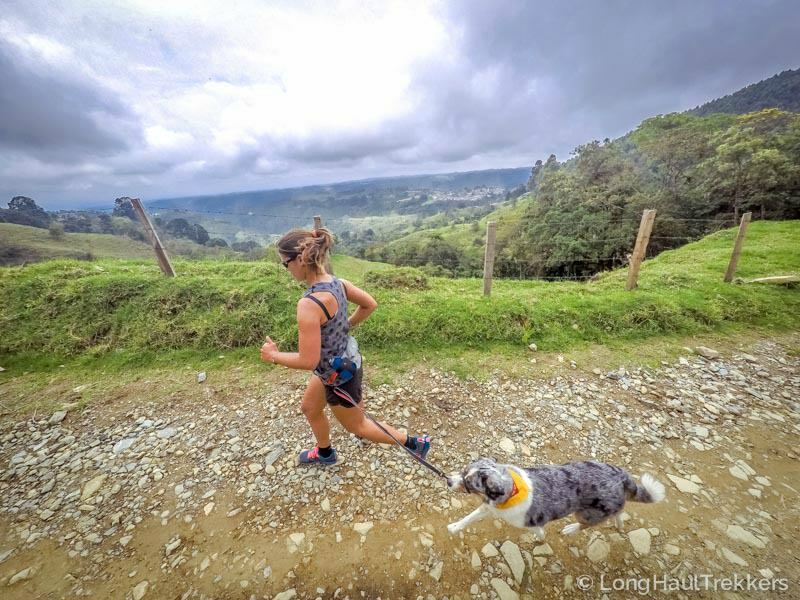 About Long Haul Trekkers: From 2015-2017, Jen has traveled the world by bicycle along with her partner, Dave and their dog, Sora, an Australian Shepherd who convinced her humans that exploring the world is much better than life behind a desk. When she’s not cycling, you can find her running long distances in the woods or hiking in the mountains. To read the stories and see the photos from her adventures, follow her on Facebook or Instagram. I can’t stand people that don’t leash their dogs when they see someone else approaching. It’s common courtesy. Nola is a fantastic off leash dog, never far from my side with a rock solid recall, and no desire to stray far from my side. That said, anytime I see someone, she’s leashed up or picked up. Off leash dogs scare the crap out of me as a small dog owner. My heart sings a little every time I see an off leash dog approaching and the owner puts a leash on temporarily, or holds their collar, to make sure they do not stick their nose in our business 🙂 Like you said, it’s common courtesy. I’m the same way my heart literally skips a beat when I see an off-leash dog approaches you mine as my dog is not friendly with other dogs due to the fact he has been attacked several times by off-leash dogs so this definitely is a pet peeve of mine especially on hiking trails and state parks it’s the law to keep your dog on a leash respect that so everyone can enjoy the trails geesh!!! The worst is when they are nearby and say “my dog’s friendly!” Cool! Mine isn’t! And it doesn’t matter because you’re interrupting my activity! Now I have to stop and spend 3 minutes separating my dog from yours and look like a jerk because I’m ruining their happiness. Sometimes I just want a walk, not a social gathering. I agree that off leash dogs approaching can be incredibly stressful. Even in areas where dogs are allowed to be off leash, that doesn’t mean they are allowed to interfere with other people enjoying the trail, meaning you should stop your dog from approaching (whether by having a solid recall and using it, or by keeping your dog on leash). That said, I was really put off by the constant talk of dominance in this particular post. Most of these issues have to do with fear for the dogs, not a desire to dominate. Dominance theory is pretty outdated and not particularly relevant, and not a good basis for learning about dog behavior. I don’t mean to discount your discomfort and concern about the use of the word. I do appreciate you mentioning it. I took it causally but I can see it being an issue for some people. One or two mentions of it don’t bother me, really. Using it a ton makes me second guess any other advice someone gives me about a dog. And while your examples can certainly be something along the lines of dominance, that is rarely the case with off leash dogs- dogs tend to be fearful, overly friendly, or dog aggressive with strange dogs, in my experience. I will say that a tip I don’t see that I would love would be to train your dog to wear a muzzle. Muzzle training is super important, and if you have a reactive dog, it can be a good idea for them to wear a muzzle, even when on leash, while hiking places where other dogs may be off leash. You know the other dog isn’t going to get bit (though muzzles aren’t foolproof, of course, and injuries can still happen). Muzzles give you a little bit more of a chance to respond before serious injury occurs (at least your dog causing injury to the other). Also, a dog wearing a muzzle can help reinforce to other people that you mean it when you say they need to keep their dog away. Again, I do appreciate your feedback. I edited the article a bit to use more descriptive words instead of just “dominance”. I wouldn’t want people getting hung up on that word and discounting the rest of the information because of it. Surprisingly, I’ve never gotten a negative comment about the muzzle. I have had more people be nasty about having a halti on my dog in public than a muzzle. I was actually surprised. Though of course, I believe that other people have heard plenty of negative things, and won’t be surprised if I hear some of it too. Thanks for bringing up the issue of the usage of the word dominance. Perhaps I didn’t explain well that in my experience, with my dominant dog, she will dominate if she’s off leash and she will dominate if an off-leash dog approaches her. For her, it’s not a fearful reaction, and that’s what I know. Can you explain why dominance theory is outdated, Crystal? I completely understand that for many dogs reactions are fear-based, but I’m not sure I understand why you associate the word “dominance” negatively. Muzzles are highly used in South America (required by law for specific breeds, with which I disagree), where we just spent the past year and a half. While I disagreed with the law, it also made it seem less “dangerous” because we saw so many dogs wearing them. It was just normal. There’s also the other side that the dog wearing the muzzle cannot protect himself if a fight should breakout. Have you ever found yourself in that situation, Crystal? It’s so hard to break the negative and aggressive association with a muzzle, especially when people love to tell others how to handle their dogs. Thanks for starting a good conversation! I get your frustration. Often when Chester and Gretel pass an uncontrolled dog that sticks it’s nose in their business, they go nuts. I do the same thing you do when I see an off-leash dog coming to avoid conflict – I pick them up. I get dirty looks from others owner’s too but I feel like, at least in some situations, they think picking my dog up is a statement about their dog and that I am afraid for my dog (that I think their dog will hurt my dogs). If they give me the look, I’ll say something like “My dog’s go nuts when an off leash dog approaches them and I don’t want them to cause a scene). I spent a few hikes seething and being terribly angry because almost all of the dogs I encountered were off leash (on a trail where leashes are the law). Now I just assume I will encounter them. It still frustrates me but doesn’t make me as angry. If I’m feeling particularly feisty, I will say something like, “please leash your dog; It’s the law.” I know that falls on deaf ears but it makes me feel better. More often than not, if I see a dog on-leash (which can actually be a rarity), I’ll say, “Thanks your for following the law and having your dog on leash.”. I’ll say it loudly enough so other people can hear me (if there are any around) in hopes of “educating them”. Anyway, I know it’s frustrating but, as Jen said in this article, really the only thing you can do is anticipate and take actions to protect your own dog and make them feel safe. Thanks! I like that response as a cool acknowledgement of the situation. I also like your “feisty” comment as well! I’ll be borrowing both, if I may? Have a great week. I hike with cute but dog-reactive rescue Chihuahuas. Unfortunately because they are cute many people allow or even encourage their dogs to approach mine. When my dogs get aggressive at the close proximity approach the other approaching dog often gets agitated too. Owners apologize but the mental damage is done. I have had so many issues with controlling them and calming them after these undesirable encounters. Now the dogs expect to be approached and anticipate problems so much that I now hike with only one dog at a time so I can regain control. It’s sad because they like hiking. I just want a big floating sign that says “Yes we are small but we are fierce- leave us alone”. I have the same problem at the “on leash only” beach. In 1 walk we had 12 unwanted approaches, 6 that were aggressive. No more beach for us. I get it and it’s frustrating. Just the act of a large dog coming up to a small dog in a confined space (which a trail is) can be unnerving for them. Now, if I don’t think the trail is wide enough to pass without incident, I just pick them up and walk by. Sometimes I get dirty looks. I think the other dog owner believes I am “saying something” about their dog when I do that. I’m not though. My dogs can be very reactive so I’m just trying to avoid an incident. I used to pick up my little dogs, but depending on the situation this can be an invitation to the other dog to attack, since the dog’s most vulnerable area is it’s stomach, and if the other dog isn’t friendly that can be a bad situation. I’ve encountered those bad situations and I stopped picking up my dog when they’re in close proximity. I have picked up my dog when the other dog is far away and I can change course. I learned this from Caesar Milan, who some people may not agree with, but the proof is in the pudding. In the dog world, it’s all about dominance. I think the tips in this article are spot on. Oh, I wanted to comment on the looks other people give you… which I think is silly considering they’re the ones with the off-leash dogs. (if they are off-leash that is).. like you said, small dogs can be very reactive and in your case if the other dog’s body language seems friendly, you’re probably just find to pick up your dog. Yes, I am wary of that when I pick up my dogs. I think the benefits outweigh the risks though, especially because I am hyper-aware of the other dog’s behavior. This is a very timely piece for me. Lilly and I hike a lot here in AZ and while her recall is good, she’s always on-leash while hiking. Part of it is because I don’t want her to make anyone uncomfortable or mess with their peace, but also because I don’t know what other dangers she might sniff out. Cactus, rattlesnakes, and coyotes are present, and each presents a different level of danger I’m just not interested in facing head-on with her off-leash. Regarding the advice of the article, I’m curious about putting yourself in between the 2 dogs; do you think that would really deflect a dog who was going to attack? Hi Elyse. The advice is NOT to get in between a dog that is actively attacking your dog and your own dog. Although I think we all do it in panic, trying to break up a dog fight that way causes a lot of people to be injured. This advice is meant for BEFORE anything like that happens. If a dog is intently focused on your dog, and approaching in an aggressive way, then, yes, stepping between the two dogs and yelling “stop!” or something like that usually startles them enough that the owner would have time to do something about it (or make them stop). As with everything in life, you should use your best judgement though. The goal is to safely avoid conflict between the two dogs. We’ve had good and bad luck with off-leash dogs. I’ve had owners happily comply with leashing their dogs, and I’ve had others that just don’t get it. Having larger dogs I worry about dog encounters with smaller dogs, because no matter who is the aggressor, it seems to me the larger dogs are the ones who are punished, especially if the smaller dog is hurt. Delilah specifically has issues with uppity dogs, if a dog is lunging at her, she will go right back at them, and if they come at her, she will not back down from that fight. So, I try and avoid all dogs, whenever possible. I agree with you 100% about the “fault” thing Jodi. I know my dogs can be really barky with larger dogs. It’s no statement about the other dogs but I worry that Chester and Gretel’s behavior might set them off. They are reacting that way out of fear but they may scare a larger dog, or put them on edge, and and provoke them to do something. I would feel terrible if their actions caused another dog to do something that got them in trouble… or either of them hurt. That’s why, if I don’t think we can pass quietly, I pick Chester and Gretel up to avoid any potential situations all together. This article is so up my alley! I have 3 dogs, my 2 Shepherds are great off leash. But my rescue Shep-Collie cross, Lexi is not. She’s a herder too. Just this past weekend we went to a lovely dog park we always visit. We’ve tried so many times to get Lexi off leash trained but it’s never happened. I have been feeling like it’s my fault for doing something wrong or missing something. So this post has made me feel a ton better. It’s okay if she’s not good off leash. I do feel bad for her when her bro and sis are free to roam off leash, but it is what it is. Thanks for sharing your thoughts Jen, it’s made me feel less of a failure. I hike a lot with my JRT Kala and must say that rules of conduct on hiking trails and nature reserves exist for a reason. Such reckless behavior is not only potentially dangerous for other hikers but also for their pets and other animals in the area. I used to let my dogs walk off leash in the woods then one day one of them yelped in pain and emerged from the brush with a mouthful of porcupine quills. From then on I’ve kept them on leash for that reason and several others. There are so many dangers people don’t think about like poisonous plants and mushrooms, snakes, etc. For small dogs, a unlikely but possible scenario is getting nabbed by a hungry hawk or eagle. If people even think about it, they often think “It won’t happen to my dog”. 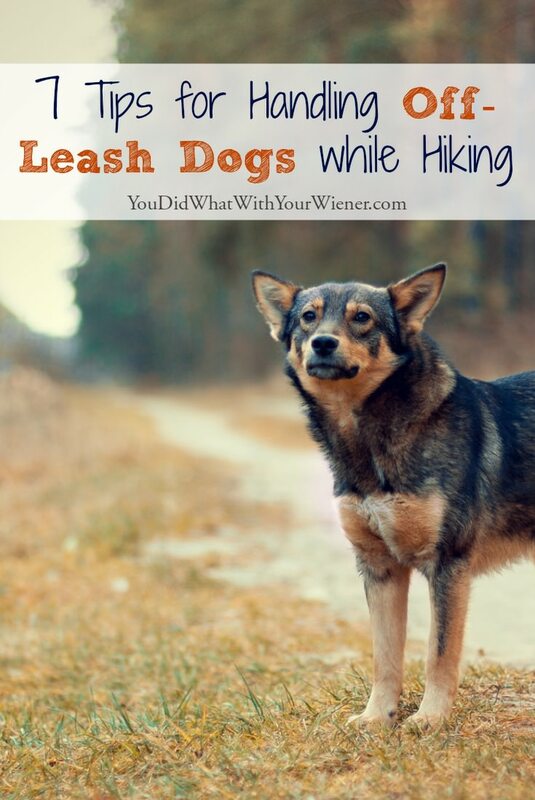 I would love to hike with my dogs off leash, and find myself letting them off for very short bits in certain situations sometimes, but they will always be on-leash dogs.